I've already shown this species recently, usually white and pink, but I think it's interesting to show this curiously brown female, a fairly rare thing I've encountered for the first time. 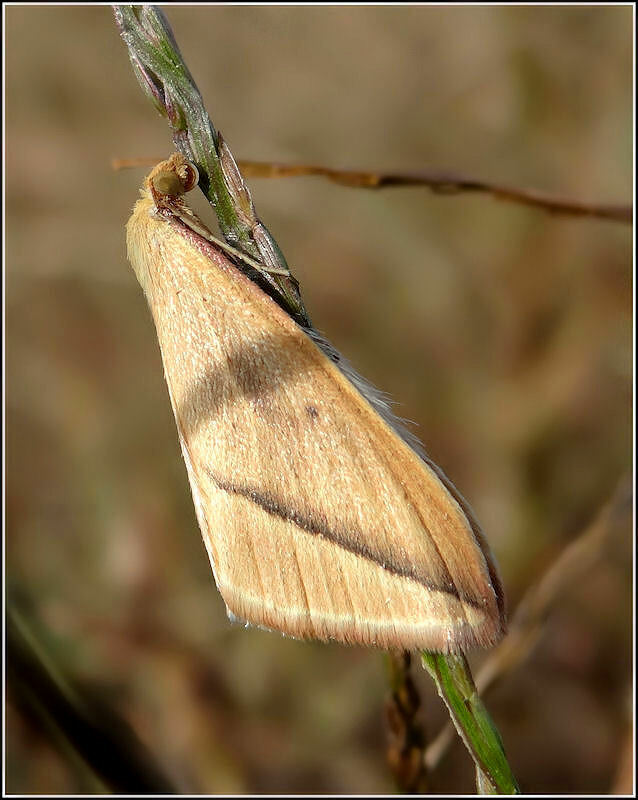 The Vestal (Rhodometra sacraria) is a moth of the family Geometridae. It is found throughout Europe, Africa and large parts of Asia. The wingspan is 22-28 mm. The length of the forewings is 12-14 mm. The moth flies from April to October and is attracted to light. The caterpillars feed on knotgrass, dock and other low growing plants. Rhodometra sacraria, piccola falena, appartiene alla famiglia delle Geometridae. Ilcolore dell'ala anteriore va dal giallo pallido al paglierino intenso, la banda diagonale varia dal rosea al bruno. Quando la pupa è esposta a temperature estreme può assumere un colore rosso vivace. Il bruco, lungo e sottile, di colore bruno pallido o verde, si sviluppa su Polygonum, Anthemis ed altre piante. La specie, migratrice, è diffusa dall'Europa al Nordafrica, si trova anche in India settentrionale. It is good to know about this species here we name this پروانہ and this has stories about, beautiful click. Well captured this Moth against such OOF background. Excellent details with well exposure. I like warm colors here too. Nice specie of moth captured in the best POV. Exceptional details and natural colors. Excellent picture Luciano. Great sharpness and details, plus very good composition. Good to see this one, just a little be different then your previous one.